This afternoon I joined Cameron and his classmate Payton at Hill School where they completed a field study for their science class. We spent 30 minutes observing a small area of wildflowers and bushes to document the butterflies and other insects in the ecosystem. While Cam and Payton mapped out the spider webs and drew the butterflies they saw, I caught a few with the camera. One of the highlights of our study was watching a female praying mantis who was hunting in one of the butterfly bushes. While she was moving she was easy to spot, but when she paused to stalk she was almost invisible. While moving in for this photo, I disturbed an adjacent branch slightly. She slowly rotated around to stare directly into the lens. After a few shots, I retreated. Even though she was only four inches long and still 12 inches away, she was quite intimidating. I’m glad I wasn’t one of her prey. Yes, I was definitely disturbing her, but I didn’t stay long and she went back to the hunt. Very cool insect. Thank you! She was fun to shoot because of her great expression. wooooohoooooooooooo look at his face..haha really cool!! I love praying mantises (manti?)! They are so determined and beautiful with a prehistoric feel to them. I worked at a university in the late 1980’s and every September, these praying mantises would arrive. I was always thrilled to start noticing them. 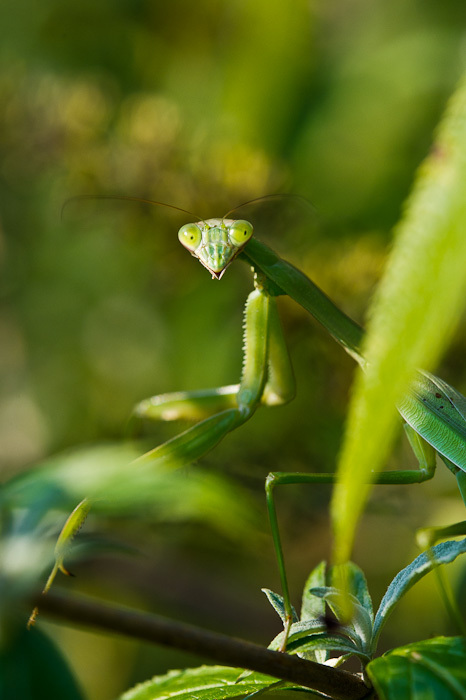 That’s a good question: mantis or manti! A agree with you regarding the prehistoric look. I find them kind of eerie. We found a male yesterday who was much less intimidating. Plus, he was much smaller. Thank you, Nia! It was an interesting moment. I wondered what it was thinking of me and if I was a threat or a curiosity. It really didn’t seem afraid. Very cool!